Pioneer Village’s Town Hall houses the police and fire department displays. On one side of the building, a few different examples of horse-drawn fire equipment are shown. On the other side is a police office complete with desks, mugs and billy clubs. Kimberly was a prosperous mining town in Central Utah not far from the old Cove Fort. The town had a reputation for its rowdy residents. While log jails were common in the frontier days of the West, Kimberly’s jail was claimed to be “the strongest jail within a hundred miles” and according to one account, it was one of only a handful of buildings in town made of brick. Inside it had two cells made of iron. A former resident remembered the cells out in the open on the south end of town. The cells had no bathroom facilities and were very small and cramped with barely enough room for the doors to open. A map of Pioneer Village in a 1966 brochure shows the jail cells located next to the “Pioneer Dentist Shop.” It’s possible they had been part of the collection as far back as the 1950s. 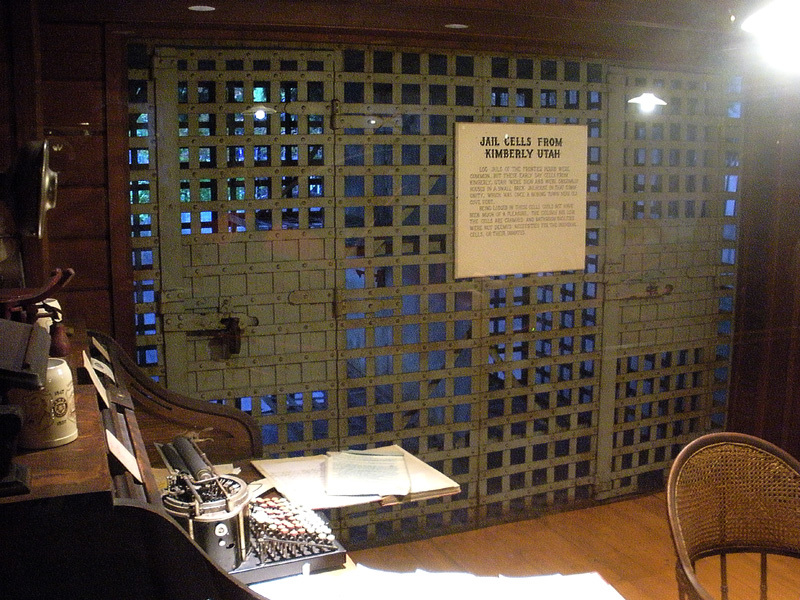 The cells were brought to Lagoon with other displays and artifacts around 1975 and were placed near Lagoon’s own prison from the 1890s. Unfortunately, no information is currently provided about the origins of the police and fire department displays in Town Hall. 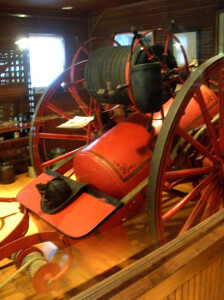 A glass case holds old fire hose nozzles, bells, keys, locks, and a model showing firefighters at the scene of a fire. A few photos and paintings, some with fading inscriptions are hanging on the back wall. While most of the buildings in Pioneer Village are authentic, the Town Hall building was built in 1975 specifically for these displays. Pace, Josephine. Kimberly as I remember her. Utah Historical Quarterly 35, number 2, page 115. Spring 1967. Croft, David. Historic Pioneer Village Opens. Church News, 5 Jun 1976. Newell, Linda King. A History of Piute County. Utah State Historical Society, Salt Lake City, Utah. 1999.